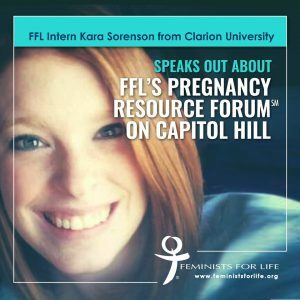 As promised, here is the speech Kara Sorenson delivered at our Capitol Hill Intern Briefing about the FFL Pregnancy Resource Forum moderated by Serrin and held at her school, Clarion University. Hope Gallagher and Madeline Davin also had an opportunity to speak at the briefing. Good afternoon. My name is Kara Sorenson. Thank you for coming out today, and for joining Feminists for Life in support of pregnant and parenting college students who are at high risk of abortion. 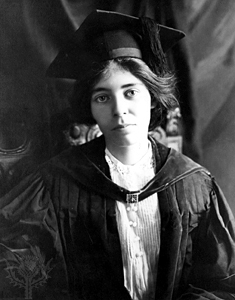 Last spring, while I was volunteering at a local pregnancy resource center, the executive director of AAA Life Services asked me to attend Serrin’s landmark speech, “The Feminist Case Against Abortion,” at Clarion University, along with a staff member. Over 200 students packed our hall. Serrin brought the feminist foremothers to life, and she united us in our desire to provide women with the practical resources and support so that women don’t have to choose between their families and their education. She led a Q&A with the Clarion students to find out what type of resources our university provides for pregnant and parenting students. She asked us if we had childcare, housing, maternity coverage, ways for students to telecommute, and many other accommodations. Most of the people in the audience weren’t really aware of what we provided, or could provide for parents. It became clear that Clarion students didn’t feel like they had the resources if they had a child. Her speech inspired me to understand more about how to help students who find themselves with an unexpected pregnancy. I decided to find out what type of resources our campus had for pregnant and parenting students. I discovered that Clarion used to have a daycare center and a place for mothers to change diapers and breast-feed… but since the first FFL Pregnancy Resource Forum in 2008 and Serrin’s earlier speech, all of these resources had slowly disappeared over time because of budget cuts, renovation of a building, and turnover. So I invited Serrin to return to Clarion to inspire a new generation of activists. On May 20, Serrin moderated a panel of 12 Clarion University administrators and four community leaders in the audience who worked together in two short hours to identify everything a pregnant woman would need to graduate with her degree from Clarion University as a student parent! Some of the topics discussed at the Forum have already been implemented, and the rest will be launched and ready to go in the fall. and a link to Feminists for Life’s Raising Kids on a Shoestring website that gives parents resources on how to raise kids on a short budget. This fall, Clarion will have a breastfeeding and diaper changing room. This fall, we will have a map of where parents can find ramps for strollers and bathrooms that have diaper decks. Parents on my campus are also encouraged to join the Pregnant and Parenting Resources Initiative, which is a student parent group on campus that gives student parents opportunities to do activities together with their kids and build one another up in an understanding community. One of the exciting events that comes from that group every year is the Clarion University annual Christmas party for parents and their children. I am hopeful that the success I experienced on my campus will be able to reach every college and university in this country, and that parents will be supported and graduate with a degree that can give them a secure life for their new and future family. Success for student parents starts with each and every one of you. I hope that you will join Feminists for Life as we advocate better support and better resources for every pregnant and parenting student, birthmother, child, mother, and father!